Red Ball Theater has been bringing American-style improvisation to the capital since 2015. Entirely English-language, the theater’s comedy classes incubated the open-mic scene, a few business ventures and as founder Peter Mezey says “More relationships than you can count.” Shows play the first Wednesday of each month and are rowdy and unpredictable, exactly the “punk comedy” scene Mr. Mezey envisioned upon founding the theater. We sat down with Mr. Mezey to hear his story. 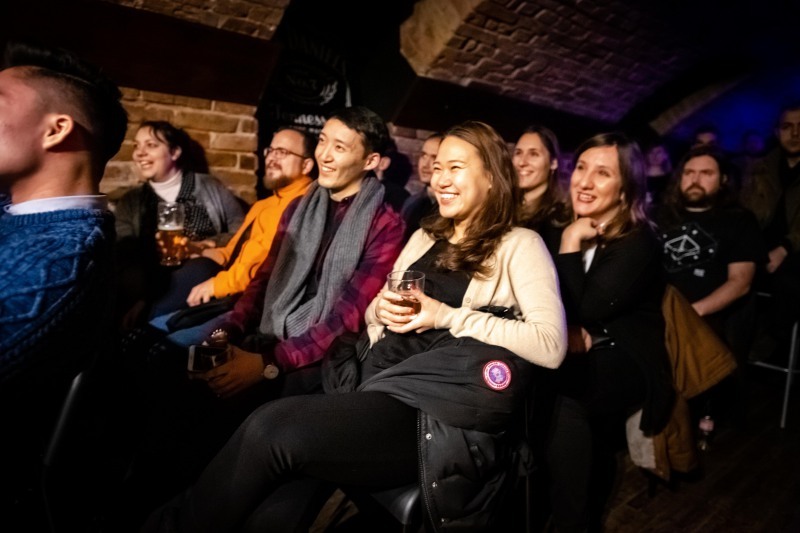 Expat Press: What inspired you to bring improv to Budapest? 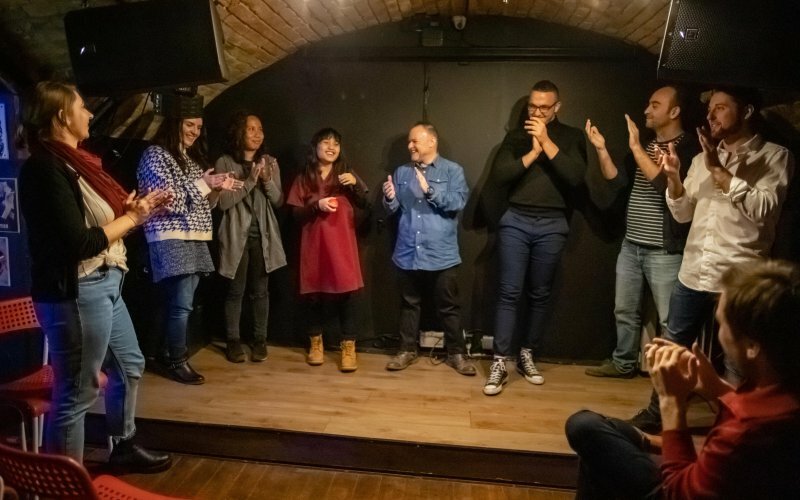 PM: Improv is a riot in New York – 20 shows a night at five different venues, 200 people crammed into basements designed for 100 with the craziest and most surprising bits destroying the audience. Everything in Europe is safe and tame so I wanted to bring the ruckus to my ancestral home. 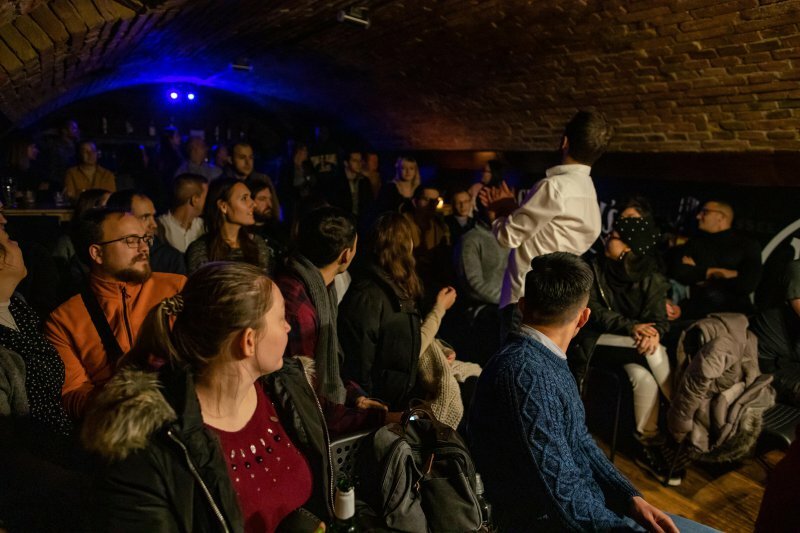 Click for more on English language theatre in Budapest. 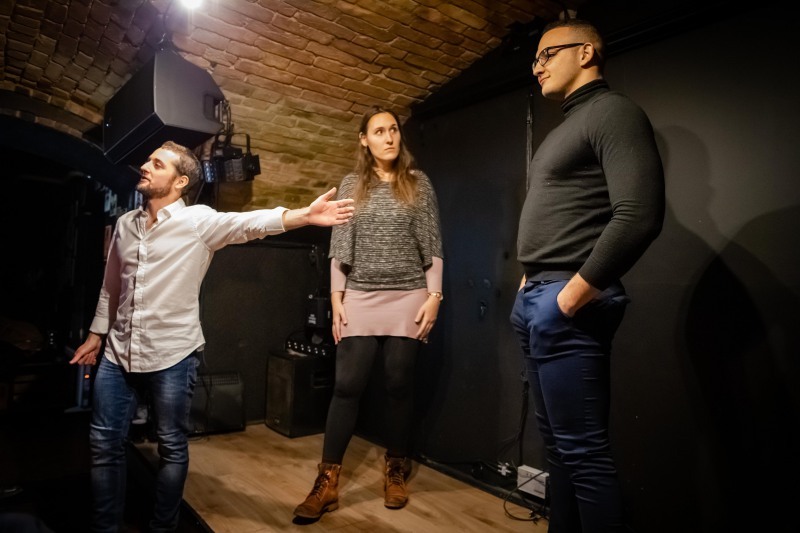 Expat Press: What’s the most challenging part of teaching improv in Hungary? PM: It’s the Central European mentality that anything that isn’t 100% right is wrong. Improv teaches you to relax. Let’s say we’re playing a game. We can be right 100% of the time and not have any fun OR we can allow ourselves to fail, loosen up and not only will we still be right most of the time but the times we fail – we’ll discover how we can do things better. The lesson of improv is that by trusting ourselves to make sense of our failures, we end up with a better product than before. We end up with innovation. This is why Americans are responsible for most innovation in the world. We don’t care about failing. That’s also why we often look stupid and we’re ok with it because it gets us to a better result in the end. Embrace failure, don’t take things personally, relax and enjoy the process. Make your partner look good and you’ll look even better. Sharing is good for everyone. Think of the world as abundant and abundant it shall be. I’m successful because I understand the nuance of the message and that’s why you can’t be put me in a box. It takes a lot to go too far and that’s what pushes people over their edges to find their true creativity, the truth they have to offer the world. THEN they can be generous. FIRST discover who you are and THEN be generous with the gifts you found because once you’ve found yourself no one can compete with you. Once you know what you offer the world, no one can compete with you, no one can out-work you and no one can out-generous you. Then you become the kind of person that mobilizes others to action and creates mass culture-change. It’s not easy but it is simple and it’s what I teach in all my classes. Come check us out. Expat Press: Are you a businessman, a teacher or an artist? PM: If I’m an artist, teaching is my art. Even before discovering improv I was teaching whatever I knew. In college I taught programming to inner-city kids as a way to get them excited about algebra. Algebra is the number one indicator of financial success: the kids that don’t get it drop-out and the kids that do get it escape from poverty. We made algebra cool by coding up rocket-ships and Tetris. Improv is the algebra of your social life. If you learn to relax and find the funny in any moment, the reward is social freedom. If you stay up-tight and in your head you’re stuck on the path someone else made for you. It’s simple. That’s why level 1 changes lives. Expat Press: Level 1? That’s your improv course? PM: Yes, it’s 8-weeks and we take beginner’s from no experience to running their own show. There’s nothing else like it. The friendships are deep, the shows are a blast and the change in mindset is miraculous. It’s my passion. Expat Press: What kinds of students attend classes? Generally the 20-39 range: Programmers, managers, students, a few artists and serious actors. There’s always someone older in each group and they balance the group out with experience and wisdom. I’ve also taught in high schools, corporations, even prisons. The techniques work with everyone. Expat Press: Do you only teach improv? Improv is the core of what we do but there’s a rotating series of other classes, including Public Speaking, Social Confidence, Authoritative Presence for Women, How to organize Events, Emotional Management and Self-Care. Tuesday Improv Drop-ins and monthly shows are just part of Red Ball Theater’s ever-growing roster of events. Each class is designed to show a part of yourself you’re blocking and unleash the creativity and confidence behind it. For full events see Facebook and for mail-list sign up through the website.